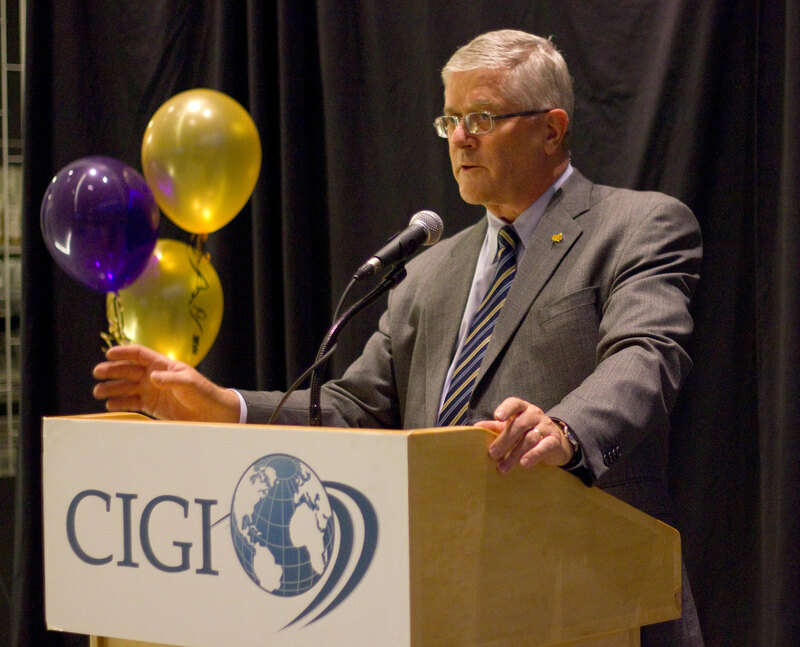 Max Blouw, president of Wilfrid Laurier University welcomed a room full of international students at the Balsillie School of International Affairs (BSIA) Monday evening as part of the international students welcome. It was the university’s chance to extend a formal welcome to the students who are joining the Laurier community in both Waterloo and Brantford this year. Laurier staff and faculty alike were in attendance, hoping to better acquaint themselves with the students and support them in the commencement of their exchange journey. Students had the opportunity to mingle with each other and members of the community prior to and following the speeches. Blouw and David McMurray, vice president of student affairs, were the two speakers at the event. Blouw began his speech by talking about BlackBerry and Research in Motion (RIM). Jim Balsillie, the former co-CEO of RIM, funded the construction of the BSIA building, which was something that Blouw said was a testament to Balsillie’s support of the programs that take place there. With over 17,000 undergraduate students, Laurier, including Brantford, is today considered to be a mid-sized university. Blouw spoke to the growth the university has seen in population, but also in reputation. He invited the students to contribute to increasing that reputation and bettering their community. A piece of this culture that students encounter at Laurier is an emphasis on academics, but McMurray also pointed out the focus the community has on the individual and the personal development of students while they are attending school here. “What we’re trying to do with an event very much like this is to encourage you to engage with each other, with faculty, with staff, and really take in all that a global exchange opportunity like this one,” McMurray said. Getting involved while here on the exchange has reciprocal benefits for both themselves and the community at large. Blouw echoed this by encouraging students to reach out to their classmates and engage with the people they will meet. After conversing with a number of exchange students following the speeches, Blouw took a few moments to speak with The Cord, and he expressed his expectations for the upcoming school year.